The combination of great offense and talented players makes Kansas arguably the most consistent team in the NCAA the last decade plus. Thirty-one wins. Another Big 12 regular season championship. A Big 12 tournament championship. And the latest – a trip to the Final Four. Oh, and this was supposed to be a down year for the Kansas Jayhawks. 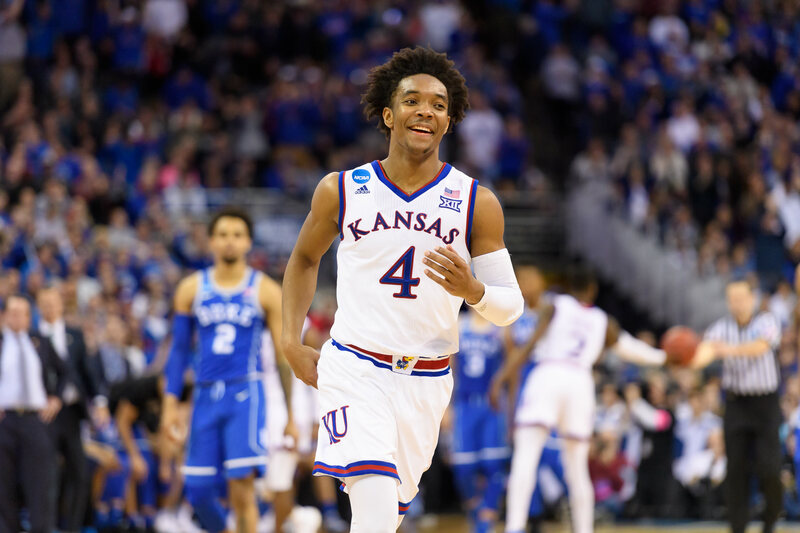 One of the primary reasons for KU’s success has been the play of its senior leader, Devonte’ Graham. Throughout the 2017-18 season, Graham has been among the team leaders in points (17.2 ppg – 1st), 3-point shooting (40% – 3rd), and assists (7.3 apg – 1st). If the Jayhawks want a shot at cutting down the nets, the All-American guard must be both a scoring threat and an offensive catalyst in San Antonio. Let’s look at what makes Kansas so tough to beat. Click on a diagram to download it to your FastDraw library. Baseline out of bounds have always been one of Coach Self’s fortes. Four low. Box sets. Four low plays that look like box sets. 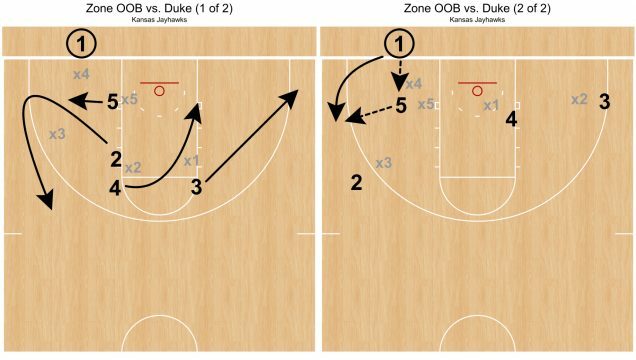 But the Kansas coach had a few special looks for Duke’s match-up zone. As all four KU guards have the ability to shoot from deep, Duke was left a perimeter defender down against the Jayhawks’ BLOBs. This quick toss back to Graham was just one of KU’s 13 three pointers on the night. But with this year’s Jayhawks, bite on the drive and you’re toast. Stunt too far at the driver, and it’s an automatic kick to a guy shooting no less than 38% from three. 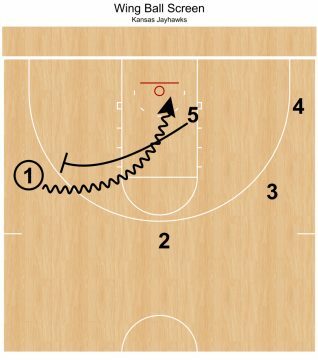 And when you have a player like Graham – set a ball screen at the end of the shot clock, and it’s pretty much over (1.093 PPP on offense derived from PNR). Go under, and he’ll shoot from deep. Hedge, and he’ll find the diving big. Chase over, and he’ll score or get fouled. Kemba Walker. Tyus Jones. Joel Berry. If recent history has taught us anything, it’s that point guard play has the potential to win you a national championship. With a big weekend from Graham, the Jayhawks could be hanging another banner in the Phog. Follow Tony Miller on Twitter and view all of his submitted sets on the FMS PlayBank.